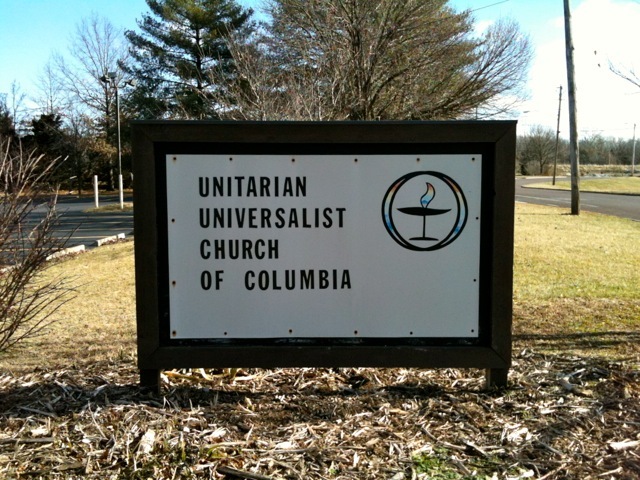 From Danbury, I went to the Unitarian Universalist Church of Columbia (MO). 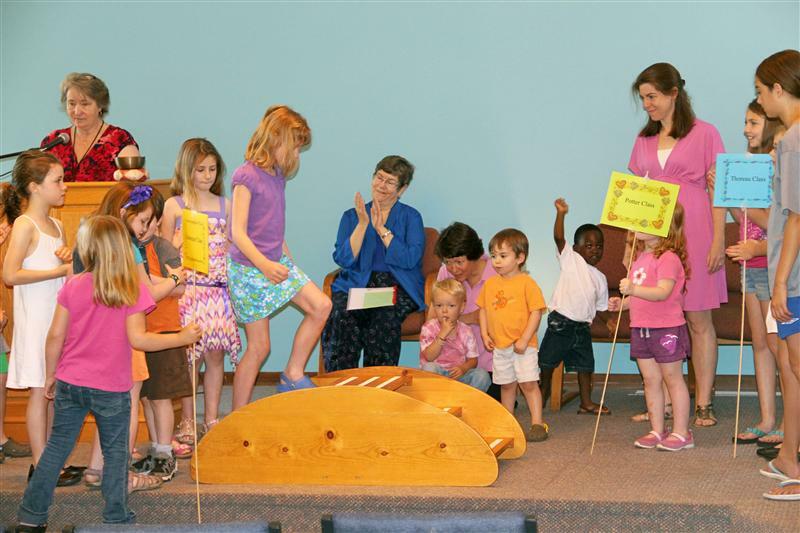 UUCC is classified as a small mid-sized church, with an approximate membership of 225. Founded in 1951, it has reinvented itself several times over the years: from a lay-led fellowship meeting on the University of Missouri campus (1951-70), to a lay-led congregation with its own building (1970-80), to a small church with a minister but little other staff (1980-89), and finally to a full-service church with a staff of four and a substantially expanded building. That last expansion took place during a fruitful 21-year ministry, from 1989 to 2010. Long, stable pastorates are generally helpful to congregations, providing a holding environment for sustained growth and development. 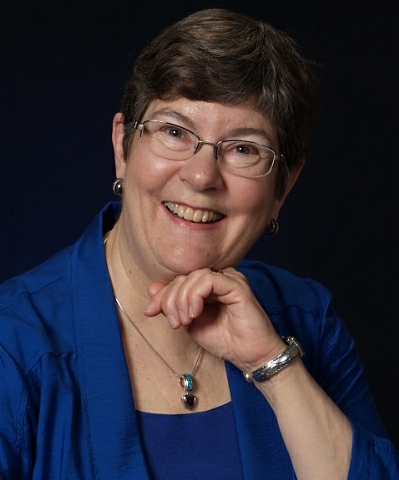 Nevertheless, there are certain risks involved; congregations can become complacent, or disconnected from new thinking about ministry. Sometimes success in one generation can even lay the foundation for failure in succeeding ones. The Columbia church, though still strong in many ways, was by 2010 showing signs of slippage. Membership, which at its highest had been over 250, had fallen to 225, with a similar drop in adult worship attendance. 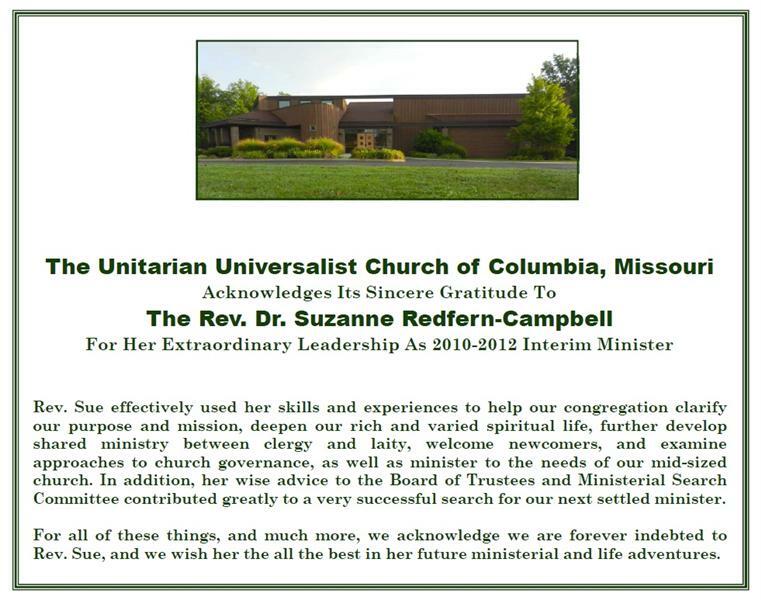 During my two-year interim in Columbia, I learned of people's deep gratitude and appreciation for the congregation and what it had meant to them. But what confronted me, on my arrival, was what Alban consultant Larry Peers would call a "problem saturated narrative." At my first meeting with the Transition Team, members presented me with a list of "8 Emotional Hot Button Issues" needing attention - issues subsequently confirmed by my own observations and through conversation with other lay leaders. Given this, I suggested to the Board that we spend a few months reading Dan Hotchkiss' Governance and Ministry together, with a view to examining and possibly revamping UUCC's structure. They agreed, and during the first few months began to take action, following Hotchkiss's recommendation to form a Governance Task Force. I worked closely with the GTF, and within six months the Board adopted two significant Task Force proposals. First, they developed a policy making the minister the head of staff. Second, they dismantled the three-part Council in favor of a more flexible and responsive ministry structure. During the second interim year, with my strong encouragement, the Board tackled another governance issue, rethinking its relationship with the Finance Committee. Moving into my new role as head of the very capable staff, I introduced structured but still relatively informal monthly staff meetings, and began to develop new job descriptions for each position. At the same time, I began to address the nonfunctioning Care and Membership Committees. With regard to the former, I recruited as chair a woman who has both a passion for congregational care and exceptional organizational skills. Together we established a congregational Caring Network of some 60 volunteers, coordinated by a Core Team. As for Membership, I seized upon an offer by the Rev. Patrick Price to conduct an "evangelism audit" of the church. This led to several initiatives: the Board recruited a Design Team to work on aesthetics, and a new Membership Team to focus on welcoming and assimilation. Preaching and worship are as vital to interim work as they are to settled ministries. From the beginning, I made a point of devoting substantial time to sermon preparation. When I learned that the former minister had not taken a regular sermon-writing day, I made sure everyone knew that mine was close to inviolable. Many people told me that my preaching had rekindled interest in Sunday worship, even among some who had previously attended only the Forum. With the DRE, introducing occasional multigenerational services on Sunday mornings, usually on "festival" days such as the Sunday before Thanksgiving, and St. Nicholas Day. Working with the Generosity Team on the annual stewardship campaign. Consulting with and supporting the Ministerial Search Committee, as requested. This support included becoming a booster for Columbia and UUCC, getting the message to colleagues that this was a wonderful opportunity. Supporting the Social Action Committee and raising the visibility of social justice initiatives in the church. Reaching out to various groups, such as the Forum and Pagan groups, that were feeling either marginalized or disaffected. At the end of two years, the congregation called an exceptional young woman to be its new minister. (She's 28, a real departure for UUCC, whose ministers had all been over 50.) I left with a strong sense that the interim years had been fruitful - an invigorated congregation with an expanded vision of ministry. The citation pictured here was presented to "Reverend Sue" at her farewell party on May 27, 2012.